This July, Defiance, Ohio made available on its website, with no prior notice, two new songs. Subsequent weeks saw the release of four more. All six comprise The Calling, a self-released digital-only EP that is in part a celebration of the band’s tenth anniversary. Defiance, Ohio was a very different band ten years ago. Formerly an acoustic trio, its unique brand of folk punk has evolved considerably. The Calling retains some of the acoustic elements upon which the band was founded, as “Bad Ideas” is initially a 3/3 acoustic solo number, until the percussion gradually enters and the song becomes a swaying singalong. The violin is a crucial component throughout the EP, particularly on the title track, where it accompanies the vocal melodies and forms the song’s best hooks in the form of cheerful interludes. With its playful chorus, “I’m Against the Government” is a rollicking, dancy protest song and perhaps the closest the band has come to stripped-down garage rock. “Call it a Comeback,” inspired by Nigerian writer Chimamanda Adichie, features verse swapping and a rhythm that brings to mind the indie-rock leanings of Interpol. Standout “Horizon Lines, Volume, and Infinity,” is both a youthful ode to friendship and a recognition of one’s own naivety, and showcases Theo Hilton’s poetic, colorful lyricism. “At times I’d like a map to what I cannot comprehend. But infinite cartographer, your trusted magic pen can only ink against the edge of understanding,” sings Hilton. Reminders of the band’s spirited approach, exclamation points repeatedly punctuate the anthemic declarations throughout the song’s lyrics, while the recurring melody of a Wurlitzer piano in between-verse transitions renders the song all the more memorable. A re-recording of the angst-filled “I’m Just Gonna Leave Now” from Defiance, Ohio’s 2003 demo bookends The Calling. It’s a perfectly suitable conclusion to a release as celebratory as this, with cleaner production and improved harmonies illustrating the band’s evolved maturity and precise musicianship. It was, after all, the first song the band ever wrote. 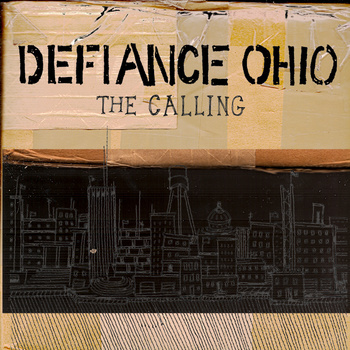 As the members of Defiance, Ohio are currently scattered across the United States, The Calling shows a band whose songwriting ability is unaffected by geographic separation. There’s a well-defined sense of identity on each of these songs and, while the writing style of each member is fairly distinct, The Calling is nonetheless a collaborative effort with prudent lyrics, well-placed harmonies, and thoughtful arrangements. This entry was posted on Saturday, September 15th, 2012 at 1:35 am	and tagged with Chimamanda Adichie, defiance ohio, folk punk, interpol, review, the calling, violin and posted in News, Reviews. You can follow any responses to this entry through the RSS 2.0 feed.